Proteinuria indicates future renal and cardiovascular morbidity, and, conversely, its reduction is associated with improved outcome. In a randomized, double-blind trial with parallel group design, the antiproteinuric effect of candesartan at high doses was analyzed. Patients with normal or mildly impaired renal function, protein excretion rate of 1 to 10 g/d, and treatment with an angiotensin-converting enzyme inhibitor or angiotensin receptor blocker for 3 mo were eligible. 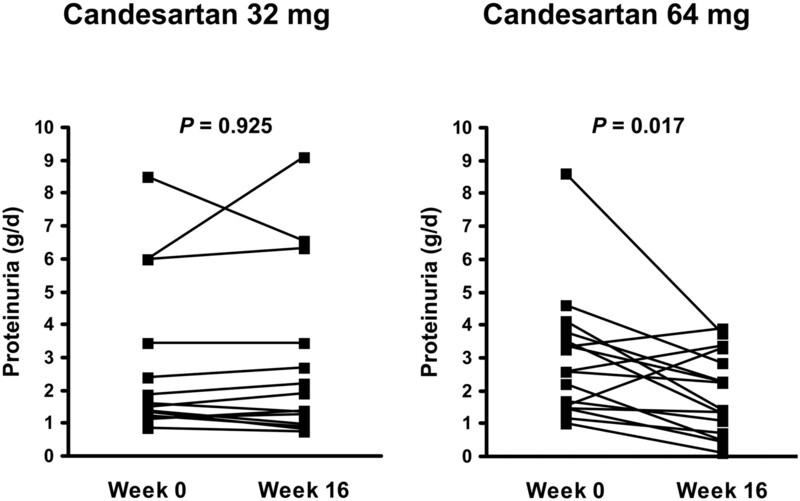 After a 4-wk treatment with 16 mg/d candesartan, patients (n = 32) were allocated to double-blind therapy with either 32 or 64 mg/d candesartan for 12 wk (including 4 wk of uptitration), followed again by 4 wk of candesartan 16 mg/d. Proteinuria at study entry was similar in both groups (geometric mean [95% confidence interval (CI)]; 32 mg/d candesartan 2.14 g/d [95% CI, 1.45 to 3.17]; 64 mg/d candesartan 2.54 g/d [95% CI, 1.91 to 3.40]; NS). After the double-blind treatment phase, proteinuria was reduced to 1.42 g/d (0.85 to 2.37) in the 64-mg/d group (P = 0.017), without any change in the 32-mg/d group (2.02 g/d [95% CI, 1.26 to 3.26]). The change in proteinuria differed between the two groups in absolute (P = 0.025) and relative terms (−29 ± 50 versus −0 ± 26%; P = 0.012). After downtitration to 16 mg/d candesartan, proteinuria increased again to 2.38 g/d (1.57 to 3.62) in the 64-mg/d group (P = 0.001) but remained unchanged in the 32-mg/d group (2.04 g/d [95% CI, 1.17 to 3.57]; NS). No change in BP was noticed in response to the different doses of candesartan. These data indicate an additive antiproteinuric effect of ultrahigh dose of the angiotensin receptor blocker candesartan compared with standard dose. Chronic kidney disease (CKD) is a major health problem in the United States and Europe. The prevalence of ESRD has increased progressively in the past decades. By the year 2010, it is estimated that the prevalence of ESRD will be >650,000 in the United States, with an even more marked increase of patients with early stages of CKD (1). Proteinuria occurs in most patients with CKD and represents a risk factor for faster progression of CKD. Screening efforts aimed to identify patients who are at high risk for CKD indicate that proteinuria is an independent risk factor of total mortality (2–4). Both reduced renal function as estimated by creatinine clearance and albuminuria have been identified as independent risk factors for cardiovascular disease, renal failure, and mortality in selected and general populations (4–7). Most recently, evidence from large-scale, prospective trials has been forwarded that reduction of albuminuria is linked closely to improved renal prognosis as well as cardiovascular outcome (8,9). Thus, nephroprotective strategies to reduce proteinuria in patients with overt proteinuria emerged as a mandatory therapeutic goal. Consistently, the greater the reduction in proteinuria, the smaller is the loss of renal function in type 1 and type 2 diabetes (10–12). Of all nephroprotective strategies, treatment with antihypertensive drugs has been investigated extensively. Large prospective trials and meta-analyses have demonstrated that antihypertensive regimens that containing angiotensin-converting enzyme inhibitors (ACE-I) and/or angiotensin receptor blockers (ARB) are more effective than other regimens in slowing the progression of CKD (13–16). In some trials, the antiproteinuric effects of agents that block the renin-angiotensin-aldosterone system were greater in patients with proteinuria compared with those without proteinuria and to be mediated in part by BP-independent effects (13–15). The optimal dose of ACE-I and ARB with respect to their BP-lowering effects has been analyzed carefully. In contrast, dose-response curves for organ-protective effects of ACE-I and ARB have not been assessed adequately. Doses of ACE-I that exceed their maximal antihypertensive dose have not been examined in clinical trials, because ultrahigh doses of ACE-I (doses above those approved for antihypertensive treatment according to the Food and Drug Administration and the European Agency for the Evaluation of Medicinal Products) are associated with serious side effects, such as glomerulonephritis (17–19). Therefore, only drug doses that are approved for antihypertensive treatment have been examined for their potential organ-protective effects (10–15). In contrast, ARB have been tested over a wide range of dose, without showing an increase of side effects with ultrahigh doses (20,21). However, so far, all nephroprotective trials of ARB that have invariably shown the nephroprotective benefit of these compounds have been conducted with standard doses. In a double-blind, randomized, controlled, clinical, prospective trial in 32 proteinuric patients with CKD, we tested the hypothesis that ultrahigh doses of ARB reduce proteinuria more effectively than standard doses. Patients who were aged 18 to 75 yr of age, had diabetic or nondiabetic nephropathy with evidence of persistent proteinuria of 1 to 10 g/d and controlled arterial hypertension, i.e., BP <150/90 mmHg, and had at least 3 mo of treatment with a standard dose of an ACE-I or an ARB were recruited from eight nephrology centers in southern Germany. Other inclusion criterion was a stable renal function, i.e., a variation of serum creatinine of <25% in the last 6 mo, with an estimated creatinine clearance (Cockroft-Gault) of >30 ml/min. Exclusion criteria were ESRD, immunosuppressive therapy within the last 6 mo, known hypersensitivity to or intolerance of an ARB, known or suspected renal artery stenosis, significant cardiac or vascular disease, uncontrolled diabetes (defined as a HbA1c >9.0%), and evidence of hepatic disease. Patients could be withdrawn from the study because of intolerable side effects, exclusion criteria, noncompliance, protocol violations, and increase of serum creatinine by >25%. The study was performed according to Good Clinical Practice guidelines in accordance to the Declaration of Helsinki and with the approval of the Clinical Investigations Ethics Committee of the University of Erlangen-Nürnberg, Germany. Written informed consent was obtained from all patients before the study. The study design was a multicenter, prospective, forced titration, randomized, double-blind, controlled clinical trial. The study protocol had three phases (Figure 1): Candesartan 16 mg phase (open medication), high-dose candesartan phase (double-blind medication), and second candesartan 16-mg phase (open medication). Study protocol and phases. Cand, candesartan; ARB, angiotensin receptor blocker; ACE-I, angiotensin-converting enzyme inhibitor; Crea Cl, creatinine clearance; RPF, renal plasma flow; ABPM, ambulatory 24-h BP monitoring. To be included into the study, all patients had to be treated with a standard dose of either an ACE-I or an ARB for at least 3 mo. After study inclusion, previous ACE-I or ARB treatment was stopped and patients were rolled over to the first candesartan phase. All patients were treated with 16 mg/d candesartan to ensure a standardized stable clinical situation. Thereafter, patients received double-blind medication of either 32 mg/d candesartan and forced titration after 4 wk to 64 mg/d, or 16 mg candesartan for 4 wk and forced titration after 4 wk to 32 mg/d. The high-dose candesartan phase lasted for 3 mo. The primary objectives were to analyze the change in proteinuria from study entry (week 0) to the end of the high-dose candesartan phase (week 16) in each group. Secondary objectives were to compare the change in proteinuria from the end of the first 16 mg candesartan phase (week 4) to the end of the high-dose candesartan phase (week 16) in each group and to compare the change in proteinuria between the two treatment groups. Finally, for examining whether the effects were reversible, all patients received 16 mg/d candesartan throughout the second 16 mg candesartan phase for another 4 wk. Patients were offered to participate in a substudy with additional measurements to assess 24-h ambulatory BP and renal hemodynamics before and after the double-blind high dose of candesartan. In a total of 20 patients, both measurements at weeks 4 and 16 were evaluable and thereby entered statistical analysis. BP was measured with an oscillometric device (Dinamap 1846 SX; Criticon, Norderstedt, Germany) in a sitting position according to World Health Organization recommendations. Twenty-four-hour urine was collected six times throughout the study protocol (Figure 1), and proteinuria was measured by standard technique in duplicate. Creatinine clearance and urine sodium excretion were determined in parallel. In the subsample of 20 patients, 24-h ambulatory BP (SpaceLabs 90207; SpaceLabs Medical Inc., Redmond, WA) was measured before and after the double-blind, randomized, high-dose candesartan phase (weeks 4 and 16). In parallel, renal plasma flow and GFR were determined by constant input clearance technique with para-aminohippurate (Nephrotest; Meck, Sharp & Dohme, Hertfordshire, UK) and inulin (InU test; Fesenius, Linz, Austria), respectively, as suggested by Cole et al. and as described previously in detail (22,23). After administration of a loading dose, a steady state between infusion and renal excretion of the tracer substances was reached after 120 min. Blood samples for the determination of para-aminohippurate and inulin to assess baseline renal plasma flow and GFR were drawn as this time and before infusions were started. Blood samples were centrifuged immediately at 4°C and were stored at −21°C until measurement. Measurement of para-aminohippurate and inulin was performed after completion of the study with the investigators still unaware of active treatment in individual study participants. Details concerning the measurement of inulin and para-aminohippurate have been published previously (22). Each blood sample was measured in duplicate with a coefficient of variation of <5%. The primary objective was to analyze the absolute changes of proteinuria between week 0 (study entry) and week 16 (end of high-dose candesartan phase). Other comparisons were secondary. Analyses were performed using SPSS Software (Release 12.0; SPSS Inc., Chicago, IL) with paired and unpaired t test where appropriate. Mann-Whitney U test and Wilcoxon rank sum test were used to analyze differences in proteinuria between treatment groups and changes in proteinuria within treatment groups. Data are given as mean ± SD, with the exception of proteinuria, which is given as geometric mean (95% confidence interval [CI]) unless otherwise stated. P < 0.05 (two sided) was considered to be significant. The study cohort comprised 32 proteinuric patients with CKD (Table 1). The cause of CKD was glomerular disease in 24 patients, type 2 diabetes in five patients, tubulointerstitial disease in two patients, and unspecified disease in one patient. Twenty patients participated in the substudy with 24-h ambulatory BP monitoring and assessment of renal plasma flow and GFR. There were no significant differences in the baseline characteristics when patients who were enrolled in the substudy protocol were compared with the whole study group (data not shown). The average casual BP was 135 ± 15/84 ± 8 mmHg (n = 32), and the 24-h ambulatory BP was 131 ± 14/81 ± 10 mmHg (substudy; n = 20). Protein excretion was on the average 2.35 g/d (geometric mean), with a range of 1.16 to 8.63 g/d, and serum creatinine was 1.28 mg/dl (arithmetic mean), with a range of 0.48 to 2.55 mg/dl. No serious adverse side effects were attributed to the study medication. Hyperkalemia without clinical symptoms developed in one patient in the 32-mg group (6.2 mmol/L) and in one patient in the 64-mg group (6.0 mmol/L). After at least 3 mo of blockade of the renin-angiotensin system with either an ACE-I or an ARB (open-label run-in phase; week 0), proteinuria was 2.14 g/d (95% CI, 1.45 to 3.17) in the 32 mg candesartan group and 2.54 g/d (95% CI, 1.91 to 3.40) in the 64 mg candesartan group (NS). At the end of the first 16 mg candesartan phase, no significant changes from week 0 to week 4 in proteinuria were observed in either group, and there was no difference between the two groups (2.02 g/d [95% CI, 1.30 to 3.14] versus 2.34 g/d [95% CI, 1.72 to 3.19]; NS). Individual changes in proteinuria after 16 wk of treatment (week 16) compared with study entry (week 0) are illustrated in Figure 2. Proteinuria decreased in the 64 mg candesartan group (from 2.54 g/d [95% CI, 1.91 to 3.40] to 1.42 g/d [95% CI, 0.85 to 2.37]; P = 0.017), whereas no change in proteinuria was evident in the 32 mg candesartan group (from 2.14 g/d [95% CI, 1.45 to 3.17] to 2.02 g/d [95% CI, 1.26 to 3.26]; NS). The reduction in proteinuria was greater in the 64-mg group than in the 32-mg group in both absolute (P = 0.025) and relative terms (−29 ± 50 versus −0 ± 26%; P = 0.012). Individual changes in proteinuria from week 0 to week 16. Analysis of the impact of uptitration on proteinuria revealed a decrease in the 64 mg candesartan group (week 4 2.34 g/d [95% CI, 1.72 to 3.19] versus week 16 1.42 g/d [95% CI, 0.85 to 2.37]; P = 0.017), whereas no such decrease in proteinuria was observed in the 32 mg candesartan group (2.02 g/d [95% CI, 1.30 to 3.14] versus 2.02 g/d [95% CI, 1.26 to 3.26]; NS; Figure 3). Again, reduction in proteinuria was greater in the 64 mg candesartan group than in the 32 mg candesartan group in both absolute (P = 0.085) and relative terms (−27 ± 35 versus 8 ± 40%; P = 0.033). Proteinuria throughout the whole study period. Horizontal lines represent geometric means, boxes represent 95% confidence intervals of geometric means, and whiskers represent range of proteinuria. At the end of the second 16 mg candesartan phase (week 20), i.e., after downtitration to the standard dose of 16 mg/d candesartan, proteinuria returned to the initial level in the 64-mg group (from 1.42 g/d [95% CI, 0.85 to 2.37] at week 16 to 2.38 g/d [95% CI, 1.57 to 3.62] at week 20; P = 0.001). No significant change in proteinuria as a result of downtitration of candesartan was observed in the 32-mg group (from 2.02 g/d [95% CI, 1.26 to 3.62] to 2.04 g/d [95% CI, 1.17 to 3.57]; NS; Figure 3). Change in BP and Creatinine Clearance. Systolic and diastolic BP throughout the whole study period are depicted in Table 2. Between the two groups, there was no significant difference at any time. In the 32 mg candesartan group, BP did not change between week 0 and week 16 (systolic P = 0.246, diastolic P = 0.917). Similarly, in the 64 mg candesartan group, there was no significant fall in systolic BP (P = 0.192) from week 0 to week 16, but there was a decrease in diastolic BP (P = 0.047). There was no difference between the two groups with respect to either systolic or diastolic BP at the end of uptitration (week 16), and there was no correlation between changes in BP and changes in proteinuria (Figure 4). Scatterplot of changes in proteinuria versus changes in BP. Changes in proteinuria between week 0 and week 16 in the 32 and 64 mg candesartan groups are plotted against changes in systolic BP over the same study period. Horizontal solid and dashed lines indicate the median change in proteinuria in the 64 and 32 mg candesartan groups, respectively. Vertical lines indicate the (not significantly different) mean change in systolic BP in the groups. Note the absence of an overall correlation between changes in BP and changes in proteinuria (Spearman ρ = 0.149, P = 0.431). Creatinine clearance was not significantly different between the two groups at week 0 and week 16, and also no change within each treatment group was observed at week 16 compared with week 0. Sodium excretion decreased in the 64 mg candesartan group, but no difference between treatment groups was found (Table 2). Change in 24-H Ambulatory BP and Renal Hemodynamics (Substudy). In the subsample of 20 patients, 24-h ambulatory BP did not differ before and at the end of the high-dose candesartan phase between the two groups (week 16). Also, 24-h ambulatory BP did not change significantly after the dose of candesartan was increased from 16 mg to either 32 or 64 mg/d (Table 3). Significant differences were found in the subgroup with respect to the primary objective: Proteinuria decreased in the 64 mg candesartan group (week 0 2.78 g/d [95% CI, 1.98 to 3.91] versus week 16 1.56 g/d [95% CI, 1.00 to 2.43]; P = 0.009) but not in the 32 mg candesartan group (2.18 g/d [95% CI, 1.28 to 3.71] versus 2.11 g/d [95% CI, 1.12 to 3.98]; NS). Similar to the whole study group, the change in proteinuria from week 0 to week 16 was significant between the two groups in both absolute (P = 0.024) and relative terms (−37 ± 33 versus −1 ± 20%; P = 0.03). 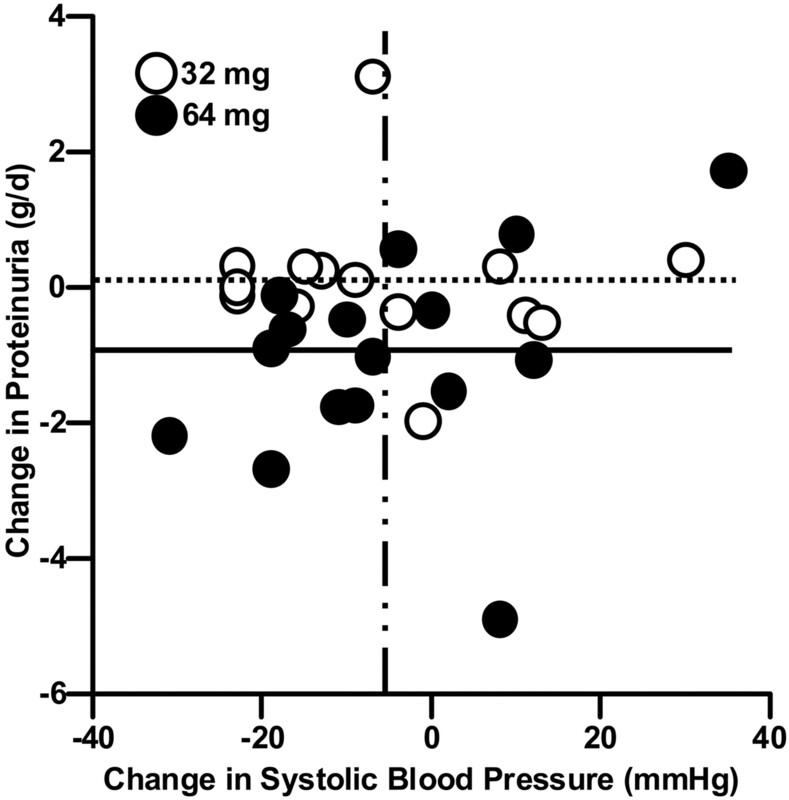 There was no correlation between change in proteinuria and change in ambulatory 24-h BP (data not shown). Renal plasma flow and GFR were similar between the 32 mg candesartan group and 64 mg candesartan group at week 4. After uptitration (at the end of the high-dose candesartan phase), again no significant changes in renal plasma flow and GFR was observed between and within each treatment group (Table 3). In clinical practice, proteinuria and albuminuria are easily evaluable risk indicators for cardiovascular and renal morbidity. In the Reduction of Endpoints in NIDDM with the Angiotensin II Antagonist Losartan (RENAAL) and Irbesartan in Diabetic Nephropathy Trial (IDNT) trials that examined patients with diabetes and overt diabetic nephropathy, the greater proteinuria, the higher was the incidence of the primary renal end point (14,15). In addition, reduction of proteinuria was related to a lower incidence of renal and cardiovascular end points (8–12), suggesting a causal relationship between increased and decreased proteinuria and renal and cardiovascular prognosis. In this study, we analyzed whether the ARB candesartan given in an ultrahigh doses, i.e., doses that exceed the one approved for antihypertensive treatment in Europe (16 mg/d), exerts additional antiproteinuric effects in patients with CKD. Previously, in an open clinical study with 10 proteinuric patients, further reduction of proteinuria was observed when the dose of candesartan was increased from 32 to 96 mg (24). Our double-blind, randomized trial now documents that in the group that was treated with 64 mg/d candesartan, reduction in proteinuria was greater than throughout the first 16 mg/d candesartan phase and greater than in the parallel group that was treated with 32 mg/d candesartan. Moreover, after re-institution of 16 mg/d candesartan, proteinuria returned to the initial level. Thus, 64 mg/d candesartan was more effective in reducing proteinuria in patients with CKD than 16 and 32 mg/d. Of note, no serious adverse event was reported in relation to the ultrahigh dose of study medication; however, hyperkalemia without clinical symptoms developed in two patients. This confirms previous studies observing no dose-response curves of serious adverse side effects with increasing dose of ARB (20,21). Antihypertensive agents reduce BP, reduce urinary protein excretion, and slow the progression of kidney disease, with ACE-I and ARB having the greatest effect (13–15). A multivariate analysis of controlled and uncontrolled trials showed that each 10-mmHg reduction in BP leads to decrease in proteinuria by 40% (25). In our study, BP was not significantly different between the two groups as documented in the whole study group by casual BP measurements and in the subgroup of 20 patients by 24-h ambulatory BP monitoring. We observed a decrease in casual diastolic BP in the 64 mg candesartan group, but this could not be confirmed by 24-h ambulatory BP monitoring. Moreover, changes in BP were not related to change in proteinuria. A similar observation has been made in antihypertensive dose ranges of candesartan (8 to 16 to 32 mg) (26). Thus, antihypertensive effects of very high doses of ARB did not predict the antiproteinuric effects. Of note, consistent results with respect to the decrease of proteinuria in the 64 mg candesartan group were found in the subgroup in which no change of 24-h ambulatory BP was observed. Finally, withdrawal of the ultrahigh dose of candesartan resulted in an increase of proteinuria, in contrast to BP that did not change. In a subset of patients, renal plasma flow and GFR were examined. This analysis did not indicate that the greater reduction in proteinuria in the 64-mg group as compared with the 32-mg group was due to changes of renal hemodynamics. Previously, an increase of intraglomerular pressure observed with the calcium channel blocker amlodipine was attributed to the proteinuria observed with calcium channel blockers; in contrast, in the group that was treated with the ARB valsartan, no such changes in intraglomerular pressure were found (27,28). Because angiotensin II increases oxidative stress and induces or accelerates fibrotic and inflammatory processes, blockade of angiotensin II at the receptor level may be responsible for the BP-independent, nephroprotective effects in the 64 mg candesartan group (29,30). In the Losartan Intervention for Endpoint Reduction (LIFE), IDNT, and RENAAL trials, BP control was equally effective in the treatment groups; nevertheless, reduction in renal and cardiovascular end points occurred in patients who were treated with ARB (8,9,12). Clearly, the specific antiproteinuric effects are to some extent independent of the drugs’ ability to lower systemic BP. This notion is supported further by experimental data showing that albumin filtered through the glomerular capillary barrier has an intrinsic toxicity on the proximal tubular cells, induces mediators of inflammatory and fibrotic processes, and contributes to the progression of renal damage (30,31). Various clinical studies support the notion that the dose of ARB is inversely related to proteinuria, independent of BP control (30–33). The largest trial in patients with type 2 diabetes and microalbuminuria, the Irbesartan in Patients with Type 2 Diabetes and Microalbuminuria (IRMA) 2 study, found that progression of diabetic nephropathy occurred in approximately 15% of patients who had diabetes and received a high dose of ARB (irbesartan 300 mg/d): In 10% of those who received a low dose of ARB (irbesartan 150 mg/d) and in 5% of the control group who received placebo on top of other antihypertensive medication (32). Other trials with ARB and ACE-I confirmed that a greater dose leads to a greater reduction in proteinuria in patients with CKD (33–36). It is important to stress, however, that so far, all of these trials used pharmacologic doses approved for antihypertensive treatment in the United States or Europe. We now applied a dose above the one recommended for antihypertensive treatment and found that 64 mg/d candesartan is more effective than lower doses of candesartan. Thus, it seems that for ARB, the dose-response curves for antihypertensive and antiproteinuric effects are not identical. One limitation of our study is the relatively small number of patients. However, we chose a study protocol that had three specific characteristics: First, by choosing a run-in phase of at least 3 mo with treatment of either ACE-I or ARB followed by a standard dose of 16 mg/d candesartan for an additional 4 wk, we attempted to achieve a stable clinical condition, before randomization, in particular with respect to proteinuria. Indeed, proteinuria and BP were stable at week 0 and week 4 and also similar between the two groups. Significant reduction of proteinuria was found in the 64 mg candesartan group as opposed the 32-mg group, irrespective of whether changes from the end of the run-in phase or the first 16 mg candesartan phase were taken. Second, allocation to 32 or 64 mg/d candesartan was at random and double blind. Third, reinstitution of the standard dose of 16 mg/d candesartan enabled us to conclude that the decrease of proteinuria during the ultrahigh dose candesartan 64 mg/d treatment was closely linked to the dose of candesartan, because proteinuria increased after reinstitution of the lower dose of candesartan without any effect on BP. One might speculate whether urinary sodium excretion has influenced our results (34). Although we cannot rule out such an effect, we believe that the effect must have been minimal. 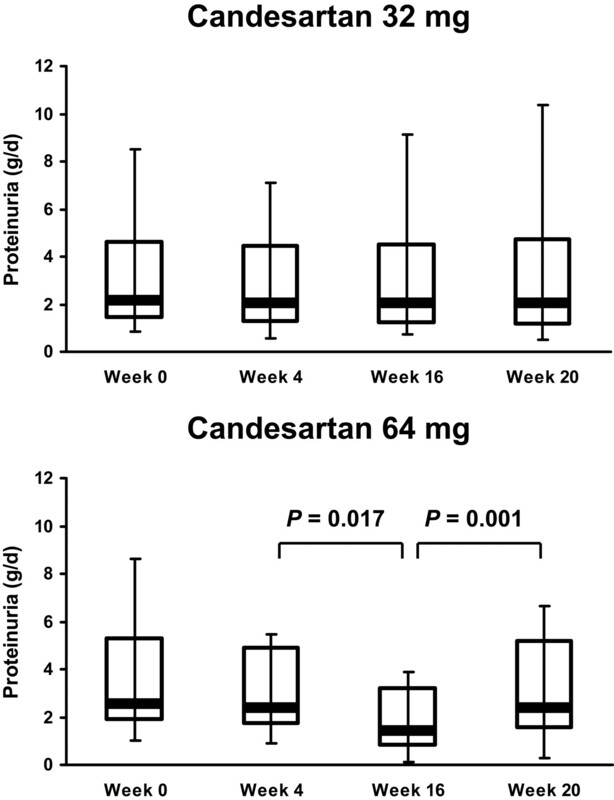 The greater reduction of proteinuria in the 64 mg candesartan group was found not only from the run-in phase (week 0 versus week 16) but also from the first candesartan phase to the high-dose candesartan phase (week 4 versus week 16). During this period (week 4 versus week 16), however, no significant change in urinary sodium excretion occurred (Table 2). No significant changes in urinary sodium excretion were noted between the 32 and 64 mg candesartan groups. Moreover, after downtitration of candesartan dose from 64 to 16 mg (week 20), proteinuria increased, whereas urinary sodium excretion did not change. We do not know whether the antiproteinuric effect will be transferred into a lower rate of renal and cardiovascular end points and whether longer periods of ultrahigh doses may have greater antiproteinuric effects. In a Danish subsample of the IRMA-2 trial (37), the study medication was withdrawn for 4 wk, and the benefit of protein reduction was maintained only in the group that was treated with the higher dose of irbesartan (300 mg/d). In this study, proteinuria returned to the initial values, but our patients differ significantly from the ones included in the IRMA-2 withdrawal trial: We examined patients with overt proteinuria and with known CKD, i.e., patients with more advanced nephropathy than the ones included in the IRMA-2 trial. At present, we can only speculate whether a longer period of medication with an ultrahigh dose of ARB leads to prolonged organ-protective effects in humans. In summary, in our double-blind, randomized, controlled, and prospective trial, the ultrahigh dose of the ARB candesartan (64 mg/d) produced a greater antiproteinuric effect than doses of 16 or 32 mg/d. This effect seemed not to be BP related. Withdrawal of the ultrahigh dose leads to a relapse of proteinuria, thereby confirming the additional antiproteinuric effect of 64 mg/d candesartan. On the basis of most recent data demonstrating that reduction of proteinuria is closely related to lower incidence of renal and cardiovascular end points, the hypothesis is forwarded that ARB at an ultrahigh dose exert additional organ-protective effects that seem to be to some extent beyond their BP-lowering effects. This study was supported by a grant from Takeda Pharma GmbH (Aachen, Germany). Preliminary data of this article have been presented at the Annual Meeting of the American Society of Nephrology, St. Louis, MO, October 27 to November 1, 2004. Participating Nephrology Centers in Southern Germany: KfH Dialysezentrum, Nürnberg, Prof. Dr. R. Schmieder, Dr. med. M. Leidig; Dialysezentrum Ansbach, Ansbach, Dr. med. S. Arendt, Dr. med. K. Bittner; Dialysezentrum, Bad Windsheim, Dr. med. T. Schmiedeke, Dr. med. R. Götz; KfH Dialysezentrum, Fürth, Dr. med. B. Büschges-Seraphin, Dr. med. J. Nikolay; KfH Nierenzentrum, Ulrich-Gessler-Zentrum, Nürnberg, Dr. med. B. Gmelin, Dr. med. P. Spiegel; Dialysepraxis, Nürnberg, Dr. med. E. Oberdorf; Dialysepraxis, Schwabach, Dr. med. J. Blume, Dr. med. A. Schischma; Privatklinik Dr. Steger AG, Nürnberg, Dr. med. K. Böhmer.